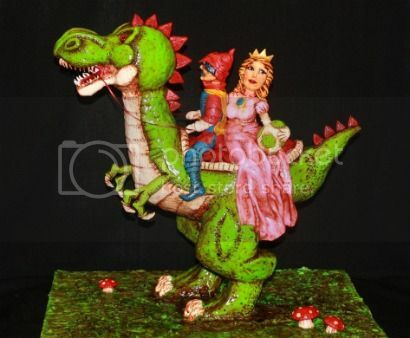 Here’s the latest doozy of an entry over at Threadcakes: based on the “Historical Reconstitution” t-shirt, Jessica K. crafted Triple Chocolate Fudge cake, chocolate ganache, Rice Krispie treats, fondant details and a few supporting dowels into this incredible display of reimagined versions of Mario, Princess Peach, and Bowser Yoshi. Check out the video below for a slideshow of the cake “making of” process, plus bonus footage of the bastards who sliced up and ate the thing. Feel free to glower and hiss at them. That’s an awesome cake. The Threadcakes rules say that you have to cut it up and take pictures of yourself eating it, so that’s why it was chopped up at the end. I’m not sure why you refer to the lucky recipients as “bastards” unless you mean “lucky bastards.” Considering they’re a bunch of little kids and the woman who made the cake!